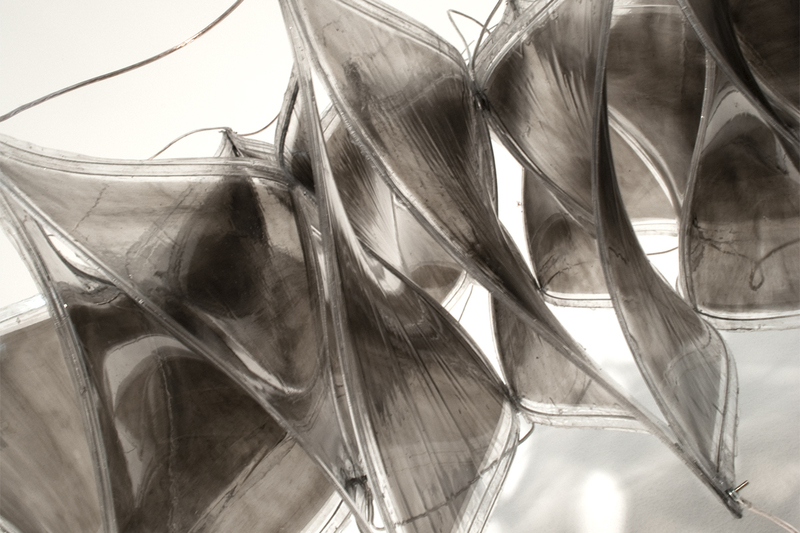 ShapeShift proposes a new possibility of architectural materialization and ‘organic’ kinetics. 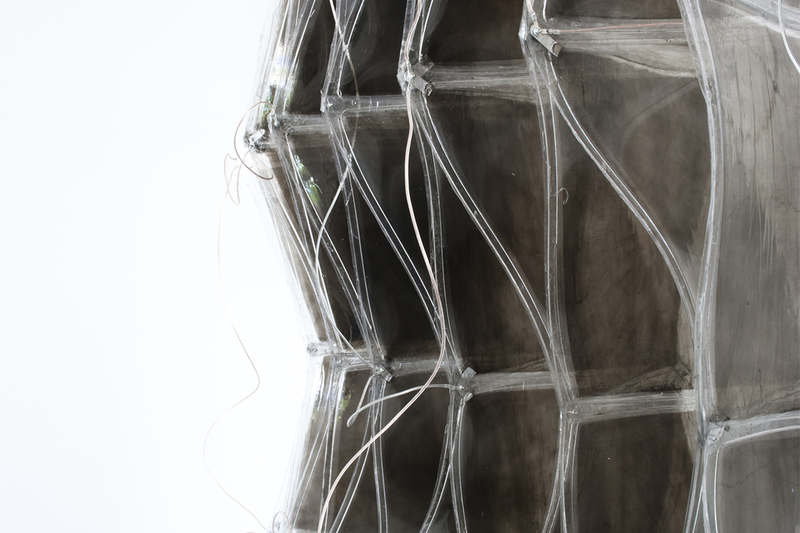 It explores the potential application of electroactive polymers (EAP) at an architectural scale. EAPs are polymer-based actuators that convert electrical power into kinetic force and change their shape correspondingly. In the field of “active materials” EAPs stand out due to their large deformation potential, high response speed, low density and improved resilience. 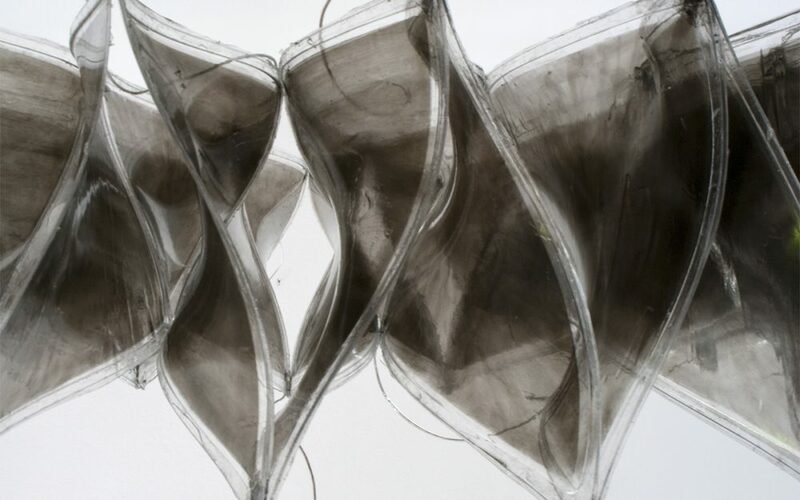 They are capable of strains up to 380 percent, extremely flexible, light, thin, transparent and can basically be tailored to any size or shape. 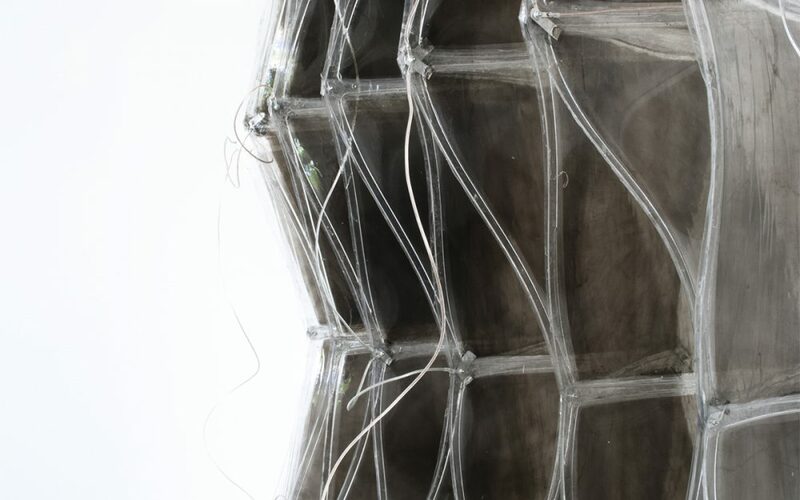 In ‘ShapeShift’ these distinctive material properties are used beyond conventional actuator replacement and become orchestrated for their aesthetic qualities. The component-based form results from the material’s desire to return into its original shape combined with structural frames that were developed to allow an appropriate degree of flexibility. This minimum energy structure retains a variable stiffness, which allows for a variety of deformations within a given range. 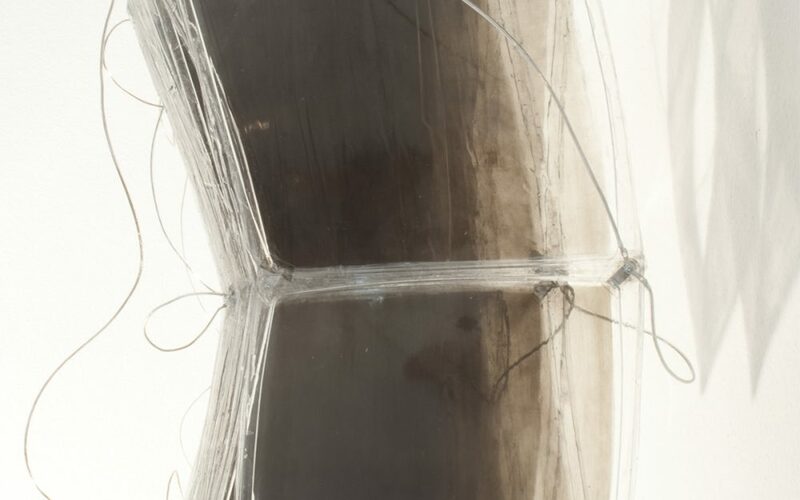 Each element consists of a thin layer of stretched elastomeric film that is attached to an acrylic frame and sandwiched between two compliant electrodes. This is achieved through coating both sides of the film with conductive powder and insulating them with liquid silicon. Once a high DC voltage in the range of several kilovolts is applied, electrical charges move from one electrode to the other and the film is squeezed in its thickness direction, which leads to a planar expansion. After actuation the EAP becomes thinner and its surface area increases. 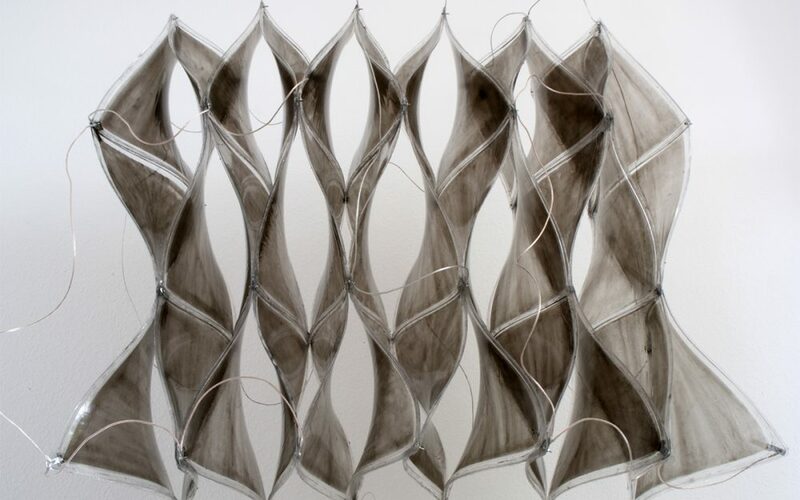 As the membranes are attached to flexible frames, due to the initial pre-stretching, the frame bends when the material is in its relaxed state. 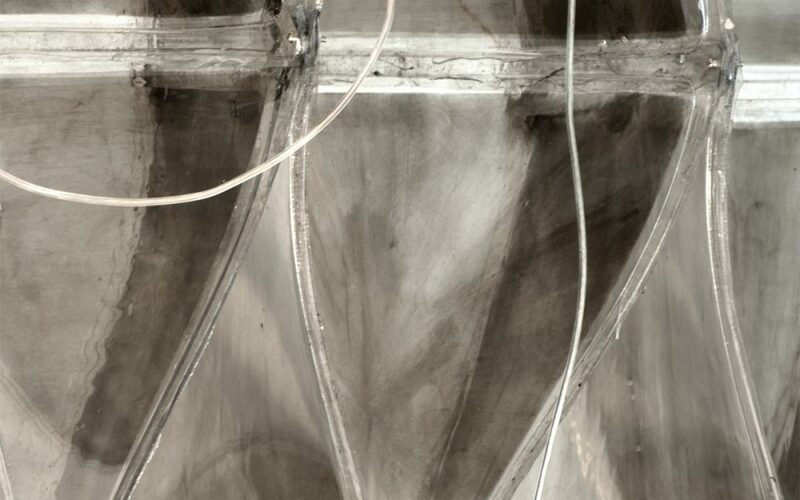 After the voltage is applied, the material expands, and the components flatten out. 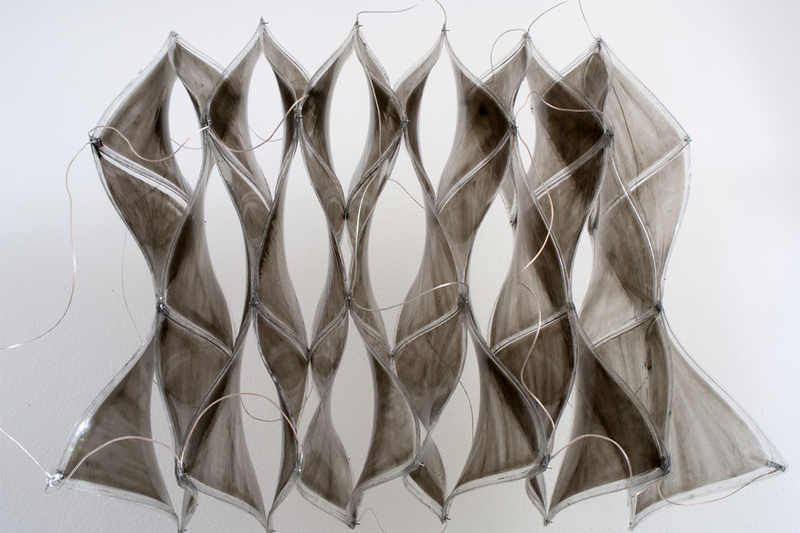 Parallel to the design of single elements, efforts in structural arrangements and tessellations were performed. Early investigations focused on static systems, but after a number of experiments the interest moved towards dynamic configurations. No static backbones are necessary as individual components are connected to each other to produce self-supporting forms. As with the single units, the dynamic structures achieve their final shape from the relationship of the EAP to the frame and their interdependent connections.